Pregis Hexacomb® is introducing the latest generation all-paper, honeycomb-based pallet solution which, for the first time, features surfaces for brand placement. Called Hexacomb® Billboard™, the new, more attractive, pallet alternative incorporates an additional outer edge wrap. It consists of kraft paper layers laminated to a clay-coated (white) outer surface onto which logos, brands, store names, etc. can be flexographically-printed in a repeating pattern. In addition to providing a branding platform, the edge wrap also improves pallet strength and durability. “In today’s competitive marketplace, brand exposure at the point-of-sale has become an important purchasing driver. The ability to add your logo to a pallet gives brand owners one more way to communicate. This is particularly valuable for products sold in warehouse stores. These items are typically stacked several pallets high and are frequently in the consumer’s sightline from the opposite end of the store. Although the product may be obscured because of its stretch wrap shroud, the exposed pallet edge can still be used to tout the brand and draw the consumer’s attention,” explained Jeff Kellar, president, Hexacomb. Hexacomb® Billboard™ pallets are already being tested in various retail environments across the United States. Ralcorp, a leading producer of private label foods and foodservice products, has already experienced the benefits. “These pallets offer a guaranteed way to turn a pallet into a ‘display’ at the retail level. They are easy to forklift and provide a great alternative to wood,” said Bill Boyer, associate director of customer marketing at Ralston Foods, a division of Ralcorp Holdings. 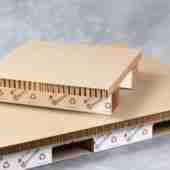 “Unlike wood, Hexacomb® pallets do not require treatment for export applications. Additionally, the use of 80% virgin fibers and the wrapped fiberboard feet help make the pallets water resistant. The all-paper based Hexacomb® honeycomb block and runner-style Billboard™ pallets provide additional performance benefits. Each pallet can handle static loads of up to 6,000 pounds. There are also significant weight benefits. Wood pallets typically weigh 40-plus pounds each vs. 8- to 10-pounds for a honeycomb alternative. This means that approximately 800 pounds of pallet weight can be eliminated from a typical truckload by converting to Hexacomb® Billboard™ which positively impacts transportation costs. The weight reduction also minimizes back strain associated with lifting heavy objects. For more information about Hexacomb and the Billboard pallet visit www.hexacomb.com.